Hello, fellow Spelunkers! Depending on how much Spelunky you’ve played thus far – available now on PS Vita and PS3, Cross-Buy / Cross-Save / Cross-Play for $14.99 – you probably fall somewhere between thinking it’s a neat but masochistic experience, to a brilliantly crafted work of evil genius and one of the best things you’ve played in years. I’m firmly in the latter camp at this point, playing in every spare moment and endlessly iterating my strategies on my quest to see the game’s true ending. Along the way, I’ve amassed a mental library of tips and tricks, both from my own playthroughs and from watching some friends in the indie developer community perform masterful runs of their own. For those just starting out, I’ve penned a list of some basic tips to shorten the time between Spelunky being the game you love to hate, and the game you just outright love. ABC: Always Be Carrying. A rock, a rat, a broken arrow – make sure you’re carrying something at all times, especially in the Mines (the first world). You’ll face arrow traps left and right, and tossing or dropping anything in their path will set them off, rendering them completely harmless. Once you get good at throwing diagonally (just aim and throw), rocks will be your best friend against bats and spiders as well. Never leave a level empty-handed, either; you can bring most objects between levels, so grab something on the way out to prepare for what may greet you at the start of the next stage. 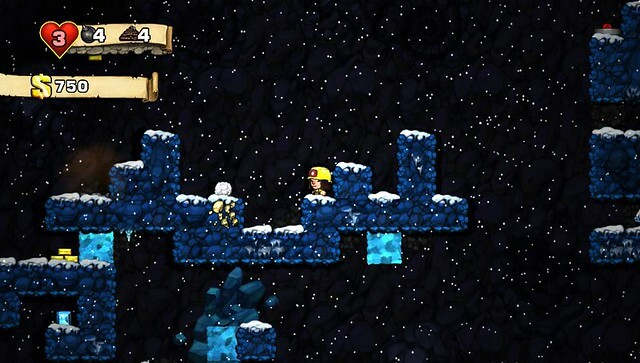 Learn the Spelunky economy. This one is a bit subjective, but I find that rescuing the damsel is almost never worth a bomb, or even a rope. The majority of your deaths will be from one-hit instakills (spikes, explosions, mantraps, etc. ), so having extra health usually doesn’t mean much – whereas precious bombs and ropes will be your key to accessing the truly important items like the jetpack and shotgun, and getting yourself out of endless jams. Conversely, the wooden boxes that hold a mystery item are almost always worth a bomb to get to, since you’ll generally be rewarded threefold with more bombs or ropes, or something even better if you’re lucky. Predictability is your friend. The spring boots are great for some extra pep in your step, but until you’ve mastered the default jumping physics, they’re probably just going to get you killed. The cape is one of the best items in the game once you get used to it, but you’ll probably control your descent right into the mouth of a waiting mantrap a few times first. Same with the sticky bombs. And the shotgun. I don’t say this to dissuade you from trying all of the items and spending the time to master them – I just recommend easing into it, and don’t grab something you’ve never used before in the middle of an otherwise fantastic run, as it’ll just get you dead. Risk assessment! That’s what the game is all about, really. 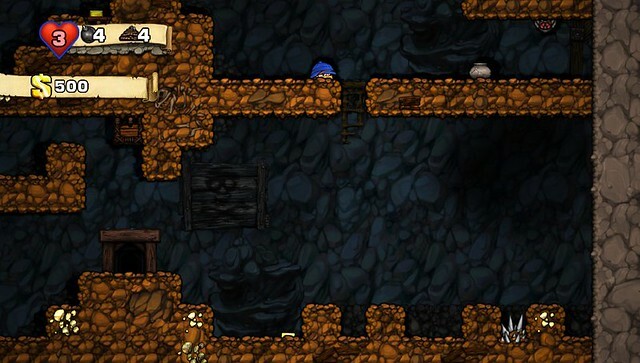 Spelunky is a constant decision tree where preventable death lies at the end of most branches. Is that emerald really worth going into the beehive for? Is that jump you’re not sure about really worth it to rescue a damsel? A kiss is worth nothing when you’re dead. Play methodically, play smartly, and don’t push your luck when you’re on a good run. Along these same lines, don’t bother killing an enemy if they’re not in your way and don’t pose an obvious risk – there’s no benefit (not even score, which is measured only in time and wealth), and you’re just upping your chance of getting hurt. Let the level do the work. Run past spiders then turn around and whip them after they drop. Set off spear traps before you cross their path, as discussed above. Whip every clay pot and pile of bones from a full square away before you walk past them. For the spiked tiki traps in world 2, jump in place two squares away from them, then while the spikes are retracting, climb on up. Let spiders and frogs jump next to you or over you before you deal with them, if it makes things easier. In general, if you can set off traps and let things come to you instead of rushing headfirst to your death, you’ll be a much happier, more successful spelunker. Practice practice practice. If you can bring the Tunnel Man that hangs out at the end of each world the three items he requires, you’ll open up shortcuts to each of the later worlds, allowing you to dive directly into them when you start. This is great for practicing worlds 3 and 4 especially, which are both a lot less scary than they seem at first blush. World 3 especially is a nice place to cool down (har har) after the hectic world 2 once you get used to it, so know that it gets easier before it gets harder again. Lastly, while I’ve never been able to consistently fight the urge to restart after every death, I find that limiting yourself to just one run a day will force you to focus and make smart decisions during that valuable run, and build a nice routine. Don’t anger the shopkeepers… yet. Robbing the shops eventually becomes an important ingredient to Hell runs, but if you’re reading this you’re probably not anywhere near there yet. So buy things politely with a smile, don’t engage enemies within the shops, and don’t grab the gold idol in the Mines if there’s any chance that the shop could be somewhere below it. Until you learn to consistently deal with the angry contingent of shopkeepers that will await you in all future levels, it’s not worth it. Play co-op! Or at the very least, alternate runs with a couch buddy. It’s a ton of fun, and seeing how other people play can really open your mind. Just be careful with that co-op shotgun! @PlayStation #Spelunky try getting the ghost to fly over some gems. They'll turn into diamonds! Just be sure to have an escape plan! I hope this has been a helpful start for budding adventurers. If you’re already an expert, leave more tips in the comments below! I’m also happy to field any and all questions there – you will defeat Olmec — it’s just a matter of time. And that’s when the game really opens up. P.S. Special thanks to Doug Wilson of Sportsfriends for contributing some great ideas and for making sure I wasn’t crazy. 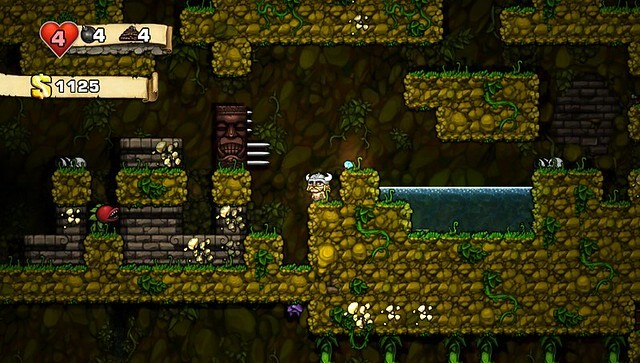 Nice collection of hints.. as a Spelunky newbie, this is super helpful. Everyone should go buy this game right this minute! It’s PERFECT for the Vita! ^ Like! It’s a killer game. I went from zero to obsessed in about 15 minutes! I’ve been playing this with my 5 and 6 year old and having a great time. Something I didn’t think I’d say, deathmatch can actually be a really good time. I hadn’t even considered it until one of the kids wanted to try it wondering what it was, it’s quick and brutal. I still can’t get very far in the main game, I’ve only made it to the ice levels twice. Any tips for getting past the bees aside from sheer avoidance? For the bees, I’ve had luck staying above and jumping on the little guys. For the queen, sticky bombs are a godsend — if you can take her out her nectar will give you four hearts. My most foolproof way to take out the queen (and most of the other bees) is to bomb above them until there’s only one square between you and them, then lay a bomb and run away (or rope up) at the last minute. Since they’ll mirror the same spot you’re at, any who’ve gathered will be killed in the blast. Also helpful: shotgun. Spelunky has been getting 90% of my gaming time lately because it’s so much fun on the Vita. I enjoyed it on the PC and now on the PS3, but the Vita makes this game insanely hard to put down. It’s one of the best 2D platformers since the original Super Mario Bros., and that’s really saying something. Are we going to get the daily challenges eventually? Yes!! I don’t know how they made it work so perfectly, but I noticed this too. I absolutely LOVE Spelunky, it’s almost unfair to other games in how much sheer replay value it has. haha We’re really lucky to be blessed with this game on the PS3/Vita. I haven’t bought this game yet, but it does seem fun. Hopefully I’ll pick it up at some point. coming to PSN? Please say “YES”! I love this game. Been playing it so much that I’m completely sick of it half the time. It does get extremely frustrating to get all the requirements, make it to the black market and then have a random toad blow up triggering everyone to be pissed at you. Wanting to throw my Vita everytime some random event has the store keepers angry at me when I dont even see them on screen. For all you smart shoppers I would recommend buying the gloves, jump boots and spike boots first if available. Also any ropes and bombs as needed. By the time you reach the black market you should be able to afford some nice things as well. A compass never hurts either! Also as said above if needed use damsels for shielding. Was wondering if there’s any performance fixes on the way for the Vita release. Namely, the slowdowns that occur pretty regularly on any fog, snowy, or worm levels. Fantastic port job otherwise, is my preferred way to play. My favorite Spelunky moment. I put a gold idol on a sacrificial alter. If you don’t know what happens I wont spoil it for you. Is it possible we’ll get the Daily Challenge mode? Amazing game, Although, after reading this, I think of Egoraptor’s video, Gaiden Awesome, that parodies how tough Ninja Gaiden is. My husband travels a lot and takes the Vita with him when he does. 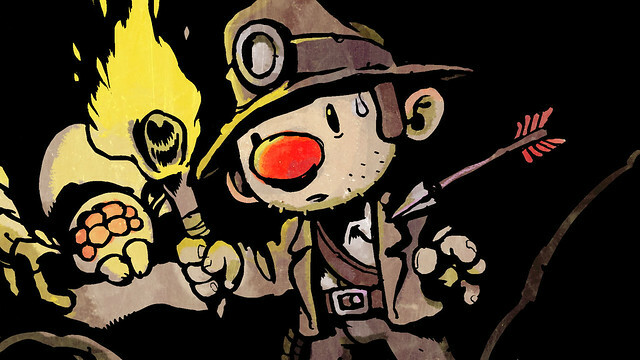 Can we play Spelunky together with remote co-op, with both of us signed in with the same PSN account? So far, only When Vikings Attack really lets us play remote co-op between Vita and PS3 on the same PSN account. Hustle Kings and others all make one of us log into a different account — this is irritating because we want the trophies to all be on our one account. So, any idea of Spelunky supporting this scenario? or suggestions on other remote co-op games between Vita and PS3? This game is a great time sink and yet also very good for just a few minutes of play, I recommend it highly, I wrote a review on Metacritic a while ago that sums everything up nicely. I wanna be doing this ^ with people. Any idea when is this awesome game coming si PSN Asia? Cheers!!! This game is my new addiction, i just tallied 500+ deaths with around 10 wins, with 3 of them from beating Hell! Got most of the trophies but the ones “Ironman” and “To Hell and Back” which didn’t unlock when i beat the game. I haven’t tried for Speedlunky and I have only 1 more journal entry i’m going to wait for a trophy glitch patch. I’m playing on my ps3. So close to 100%! Awesome post….I played the demo on PS3 and its really fun…I’ll be buying later….great game.I’ll have to see how it looks in the beauty of the OLED screen. Great game. Super duper challenging. Love the stages and character selections. It’s the only game I have died almost 1000 times with ZERO wins. Finding new secrets and weapons allow me to rejuvenate my temper and return to the game with a new puzzle most every time! Buy it!